Regional economic cooperation and integration, with regional trade and investments as primary drivers, has been an influential transformative force in bringing about inclusive and sustainable development outcomes and welfare gains in many parts of the world. Nearer home, South East Asian subregion, is the developing world’s leading example of how rich development dividends can be reaped from regional cooperation. The ASEAN has progressively deepened economic cooperation for sharpening its collective competitive edge and thereby create policy space to address domestic socio-economic challenges. Future directions for the achievement of the Sustainable Development Goals especially in South Asia would critically depend on how state and non-state actors and stakeholders are brought together under regional economic cooperation and integration (RECI) frameworks. As this Report argues, the South Asian subregion has a lot of ground to cover in terms of regional economic integration. The volatile and uncertain external environment ever since the onset of the global financial crisis sets a new context to revisit policy priorities in this regard. The subregion has been making progress on some indicators of trade and investment, notwithstanding certain intercountry differences in performance. But the progress has been slow at best, enabling it to exploit only less than a third of potential of intra-subregional trade. Through the UNESCAP resolution 68/10 on “Enhancing regional economic integration in Asia and the Pacific”, countries of the Asia-Pacific region have acknowledged the potential of regional economic cooperation and integration in eliminating poverty and, in achieving inclusive and sustainable development. The Bangkok Declaration of December 2013 on Regional Economic Cooperation and Integration in Asia and the Pacific, endorsed through UNESCAP resolution 70/1, subsequently helped in securing commitment of Asia-Pacific countries to work together for economic integration. South Asia also has a number of institutional frameworks for regional cooperation like SAARC and BIMSTEC. 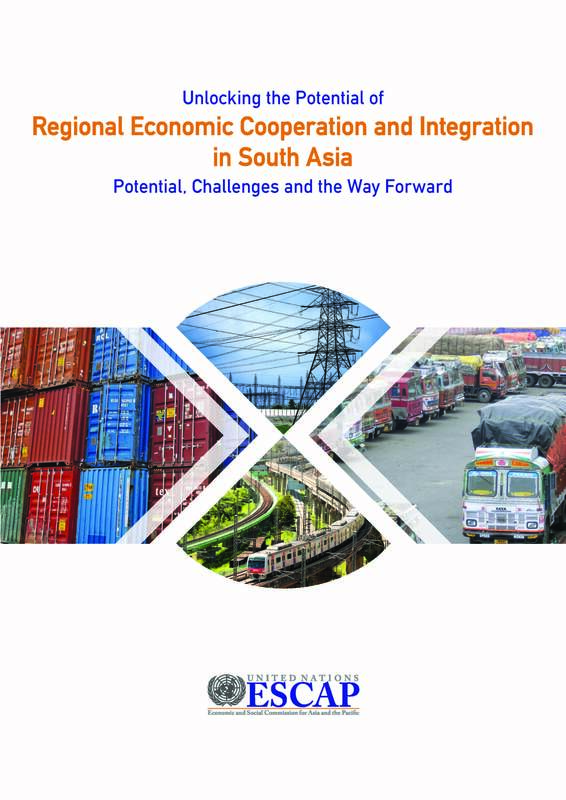 This Report tracks the status of regional economic cooperation and integration in the South Asia subregion and identifies policy priorities for the future in this regard. In doing so, it covers four broad areas of international collaboration as identified by the Bangkok Declaration; (i) market integration through enhanced cross-border trade and investments, (ii) development of transport, energy, ICT and people-to-people connectivity, (iii) greater financial cooperation for closing infrastructure gaps and liquidity support; and (iv) increasing economic and technical cooperation to address shared vulnerabilities and risks. Taking into account the low baseline scenarios and massive socio-economic challenges faced by South Asia, the report underscores the need to accelerate reforms for deepening subregional economic integration with utmost urgency. This could be achieved through putting in motion a South Asia Comprehensive Economic partnership (SACEP), recommended in this report to consolidate and build upon initiatives such as trade facilitation measures for formation of production networks and regional value chains, measures for liberalization of trade in services and improvement of investment climate,and necessary reforms for overall procedural ease of trade and investment. South Asian countries also need to take bold steps to broaden the horizons of economic relations with neighboring subregions of Central Asia, South East Asia and beyond. In this regard, South Asia’s economic integration can benefit from institutional arrangements provided under overlapping regional organisations such as SAARC, ECO, and BIMSTEC. By building synergies between various related bilateral and plurilateral initiatives and agreements for economic integration which are currently in progress, the subregional countries will have greater opportunities to secure their position in the broader Eurasian economic space. With its convening authority, multi-sectoral agenda of work and strategic presence in the subregion, UNESCAP is uniquely placed to assist in strengthening regional economic cooperation in South Asia and beyond, with a larger goal of uniting Asia and the Pacific for sustainable development. This Report is first released in May 2017 and is revised in September 2018.